According to an NBC news article on August 30th, the death toll from Harvey was at 10, but many more were missing. There had been almost 19,000 people rescued from the water and almost 300,000 people were without power. Almost 52 inches of rain fell upon south Texas and Louisiana from that single storm. People from around the world wanted to know how they could help. Within a couple days of the hurricane, I received an Email from a friend of mine who is a pastor in Denton, Texas, who told me about a relief organization based in Corpus Christi called Thirsty Ground International. Thirsty Ground (TGI) formed in 2013 in response to Hurricane Yolanda in the Philippines and has been helping people around the world since then. They have done hurricane relief work in the Philippines and Haiti. They have also helped Middle East refugees displaced by ISIS as well as flood relief in Baton Rouge, Louisiana last year. Now, however, they are helping their own neighbors, friends, and families in Texas. They were on the ground in Houston within days of the hurricane, delivering donated goods, providing tools and labor to help rebuild and clean up, and help with water purification for areas without clean water. By the time you read this, 4 or 5 weeks will have passed since Harvey’s destruction, but there is still a huge need in the Houston area. Many homes still need debris removal and gutting. Mold is a pervasive problem because so many homes have been sitting for weeks without any work crews clearing out the water. Some homes were completely submerged so restoration and cleaning crews had to strip everything out all the way to the top of the house. As of September 18th, it is reported by news outlets that up to 80% of the relief work being done had been done by Christian groups as FEMA still was not actively on the ground yet. Remember, the people from TGI are not paid relief workers like those working with the Red Cross. These are people who are taking time off from work, even using unpaid leave, some even traveling from other parts of the country, in order to help those in need. In a September 14th TGI blog post, they stated that the clean-up work is just the beginning. The people want to get back into their homes, but that could be a months-long process for many people (just as victims of the Waldo Canyon and the Black Forest fires here found out!). It is very encouraging to read some of the social media posts from TGI about the efforts in Houston and the surrounding area. It is never my habit to tell others about my giving, however, I believe it is important that all of our clients know that the work that you have entrusted us to do, whether it is repairing or replacing your roofs or gutters, is helping people affected by Hurricane Harvey. 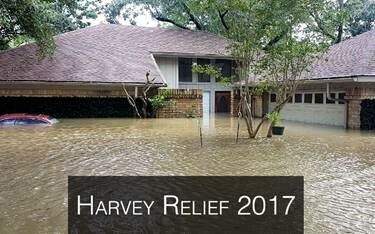 Homestead Roofing is actively partnering with TGI to help with the relief efforts in Houston. For the rest of 2017, we are donating 1% of all sales to TGI for Harvey relief, and another organization, Christian Healthcare Ministries, for aid to people in Florida affected by Hurricane Irma. We have already sent our first round of financial donations to TGI.